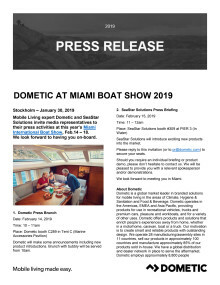 Dometic is inviting media representatives to the Dometic Press Brunch at the Miami International Boat Show for the latest new product announcements. SeaStar Solutions will introduce exciting new products into the market. Boat demo rides are available at the SeaStar Solutions booth. 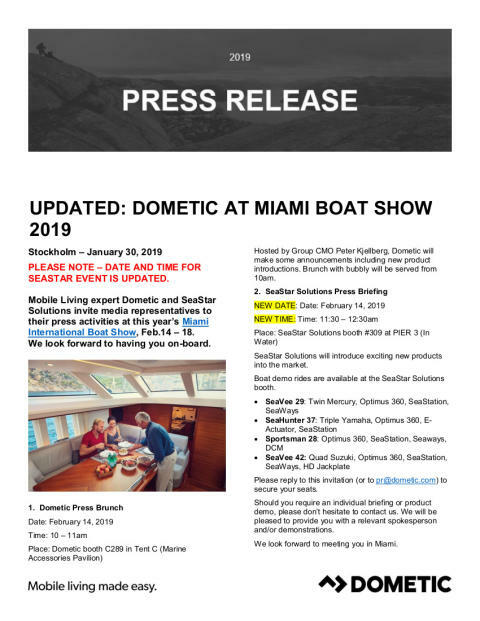 Please RSVP to secure your place at the Dometic and SeaStar press events by replying to this email. Should you require an individual briefing or product demo, please don’t hesitate to contact us. We will be pleased to provide you with a relevant spokesperson and/or demonstrations. We look forward to meeting you in Miami. Dometic is a global market leader in branded solutions for mobile living in the areas of Climate, Hygiene & Sanitation and Food & Beverage. Dometic operates in the Americas, EMEA and Asia Pacific, providing products for use in recreational vehicles, trucks and premium cars, pleasure and workboats, and for a variety of other uses. Dometic offers products and solutions that enrich people’s experiences away from home, whether in a motorhome, caravan, boat or a truck. Our motivation is to create smart and reliable products with outstanding design. We operate 28 manufacturing/assembly sites in 11 countries, sell our products in approximately 100 countries and manufacture approximately 85% of our products sold in-house. We have a global distribution and dealer network in place to serve the aftermarket. Dometic employs approximately 8,800 people worldwide, had a net sales of SEK 14.0 billion ($1.7 billion USD) in 2017 and is headquartered in Stockholm, Sweden.